The mushroom gravy is really what makes this delicious. Add it to these cutlets or BBQ chicken. Delicious! You are going to add the zucchini and red onion to a food processor, so cut them into manageable pieces. Add the zucchini, red onion, and cilantro into food processor. Pulse until mixture has the look of being shredded. In a large bowl, mix together the zucchini mixture, egg, flour, and salt and pepper. Cooking Tip: Before cooking the patties, set the mixture aside and make your sauce. This will ensure that everything stays hot and nothing gets overcooked. On medium high heat, preheat a large skillet with olive oil. Using your hands, form the mixture into balls, a little larger than the size of a golf ball. Flatten the each ball with your hand. You want them to be about ½ inch thick. Add them to the hot skillet, and cook on each side for approximately 2-3 minutes until they are golden brown. You may have to cook them in batches depending on the size of your skillet. Add more oil as needed. Preheat a medium to large saucepan with the oil. Add the mushrooms and cook on medium-high heat for 2 minutes. Add the onion powder, garlic powder, sage, black pepper, and Italian seasoning. Stir well and cook for another minute to release the flavor of the spices. Add 2 cups of the vegetable stock, apple cider vinegar, and soy sauce, bringing it to a boil. Reduce heat to medium and let simmer until the mushrooms are tender. Approximately 8-10 minutes. While the mushrooms are simmering, whisk together the flour with remaining 2 cups of vegetable stock. 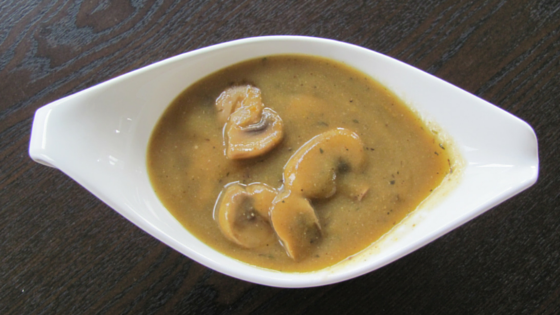 Once the mushrooms are tender, whisk into the saucepan, stirring constantly to prevent lumps. Reduce heat and simmer until the gravy has thickened. Whisk in more flour if needed. Season with more seasoning as needed, and if you are using fresh parsley, stir in chopped parsley just before serving. Place cutlets on serving plates and top with mushroom gravy.